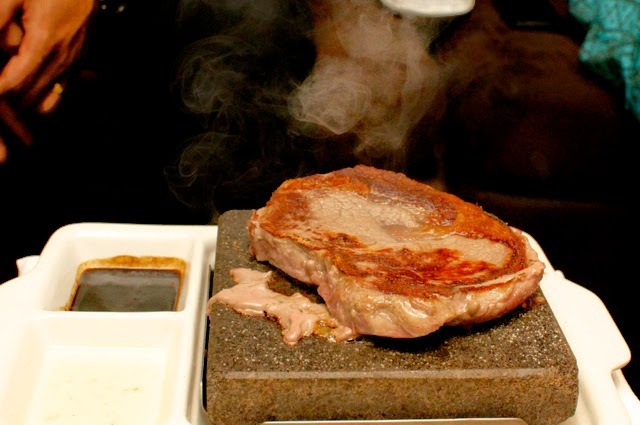 Concepts come and concepts go, but for something as unique as cooking meat on your table over a hot stone, to survive almost 5 years, is no mean feat!!!! My second visit to On The Rocks was just as fabulous as the first one! Now, don't let the gimmicks fool you. This place has a super cool lounge in the ground floor where people 'chill' before hitting the restaurant on the first floor to cook for themselves. Being a Friday night, the lounge was packed till about 9 pm after which the guests went up!!!! Nice and conceptually it gives you the pub hop feel within the same restaurant. Now, the tricks. There is a Lava Stone, heated to 400 degrees and placed right in front of you with an equally big caution placard. Place your finger on the rock and it will be cooked to medium in a minute and well done in 3!!!! So beware. For the faint hearted, there is a kitchen which will do the cooking and serve the food to your table, but this experience is worth it. Since you are doing the cooking, you need a chef hat!!! It will be given, no problem there. Tongs will be given. The set menu comes with a soup and a dessert, so it is a meal. Priced from Rs. 1350 for chicken to almost up to Rs. 4000 for premium cuts of beef and Jumbo prawns, the choice is small, but enough at the same time. Kitchen cooked dishes are priced between 500 and 4000. I don't drink, so I don't know the liquor prices, but we had one mocktail which we loved. It was orange with something and I forgot the name. We had just one of the meals and one plated dish, which was an awesome awesome mushroom dish. 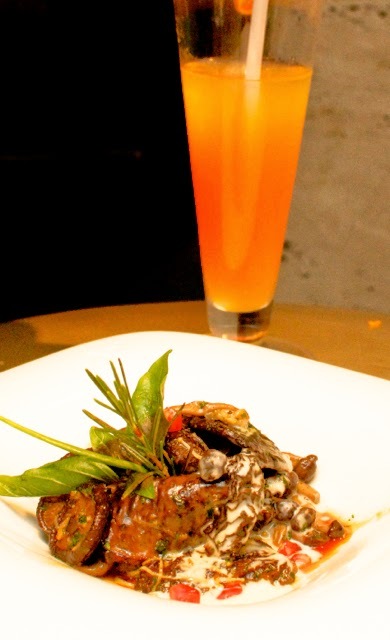 It had different types of mushrooms in it and Chef Vijay David was kind enough to explain all of them and why it makes a great dish. If vegetarian dishes were this good, I'd turn vegetarian today. Today is the 1st of April by the way. And then the dish I've been waiting for - the Lava Stone. During my first visit, I think we had prawns, so this time, I opted for the beef. On second thoughts, I would have preferred the prawns. 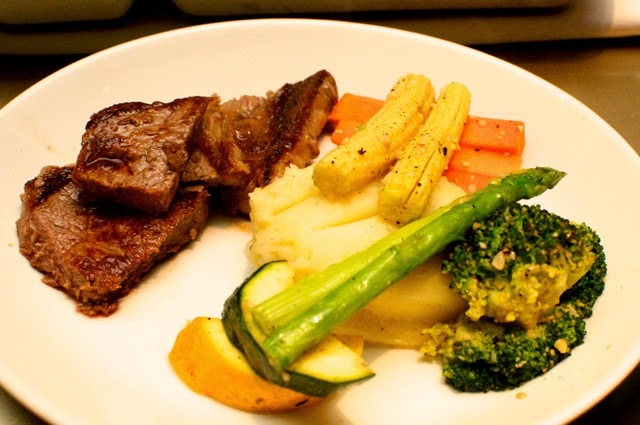 The reason being, while I love to cook, I can't cook the beef to medium, so what happened was that a perfect rib eye steak was well done and dry by the time I realised it was cooked. The a rub and the sauce that comes with it were fabulous and quite made up for the dry meat, but who else can I blame but me? So when I go back there, I'd cook the prawns and leave the premium rib eye to the experts. Dessert came flaming. 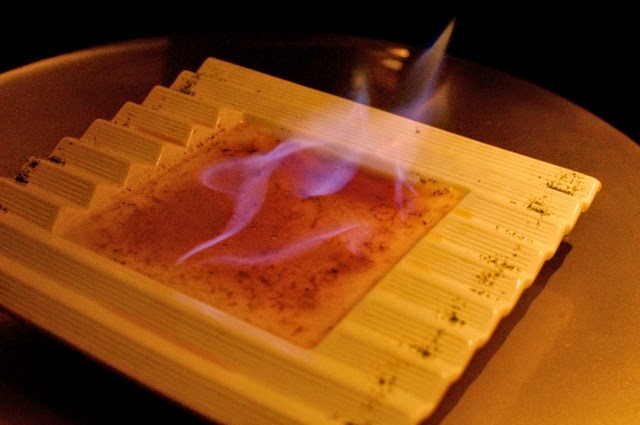 A fabulous creme brûlée. Crisp and hard on the outside, while super creamy in the centre. 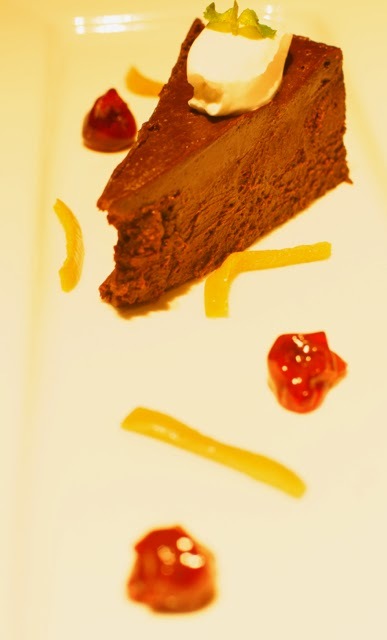 Another fabulous chocolate cake. 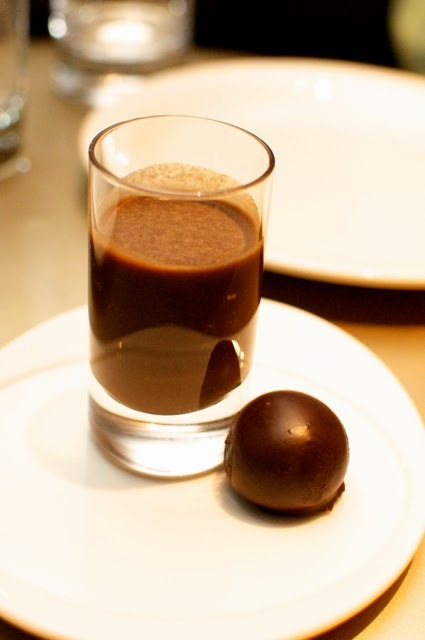 They send you off as your finish your meal with a chocolate shot! You can take the chef hat with you as a souvenir. For me it was testimony of my lack of beef cooking skills!